A unique feature of earliest Paleocene vegetation is an anomalous concentration of fern spores just above the level of palynological extinction. This anomalous palynological assemblage is known as the fern-spore spike. It is evidence that plant communities of the earliest Paleocene were pioneer communities numerically dominated by ferns, in most places of a single species. An artist's conception is on the cover of this book. 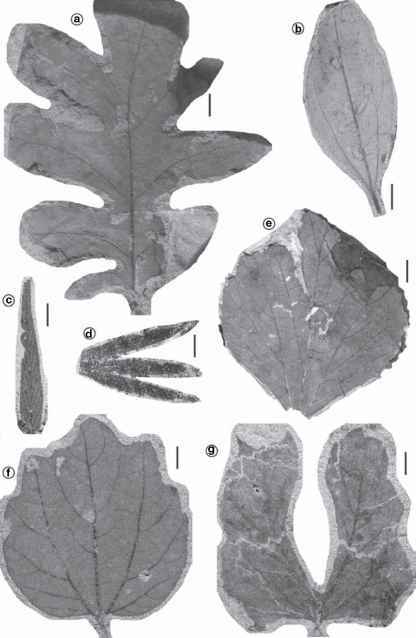 The first report of this exceptional palynological assemblage was that of Orth et al. (1981). In addition to determining that a palynological extinction horizon and the peak of an iridium anomaly were at the same stratigraphic level, palynological analysis of a drill core that penetrated the K-T boundary revealed another startling phenomenon: just above the extinction level, the ratio of angiosperm pollen to fern spores dropped abruptly and radically (Figure 5.7). A normal ratio of pollen to spores was reestablished several centimeters above the K-T boundary. In its original form, it was described as a change in the ratio of angiosperm pollen to fern spores, but since that time it has been depicted as an increase in the relative abundance of fern spores - a spike in abundance of fern spores.